Custom visuals bring great value to your organization. By using tailor-made visuals, enterprises can tell their own story and visualize data in the best way! It is not a bar chart, and it is not a line chart, it is a custom visual that tells your data story! See the Engine diagnostics summary report for a major airline. This report shows the use of custom visualizations designed for the airline industry. Where can I find those visuals? Hundreds of ready-made custom visuals can be found from our online marketplace or built in store. Can I build my own custom visuals? Absolutely! In some organizations custom visuals are even more important – they might be necessary to convey specific data or insights unique to the organization, they may have special data requirements, or they may highlight private business methods. 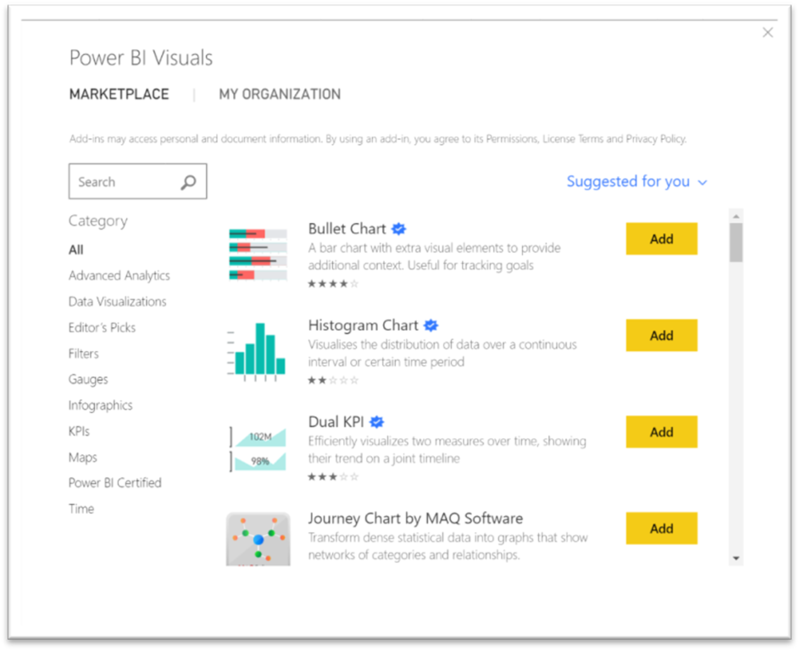 Such organizations need to develop their own custom visuals, using the Power BI opensource custom visuals framework. Alternatively, use plenty of advanced examples and ready-made samples to build their own. We have a vibrant developer community that shares ideas and are involved in technical discussions with our great support team. They can also find a consultancy service offered by one of our partners. Where organizations can get the custom visuals implemented and designed only for their own use. Such organizations want to share those private visuals throughout their organization, and make sure they are properly maintained and delivered to everyone in the organization. 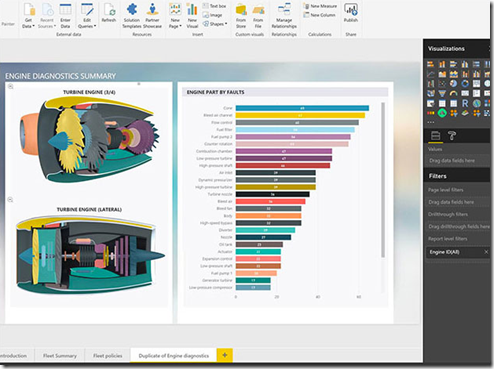 Power BI organizational custom visuals let organizations do just that. How can organizational custom visuals help an organization manage its own visuals? 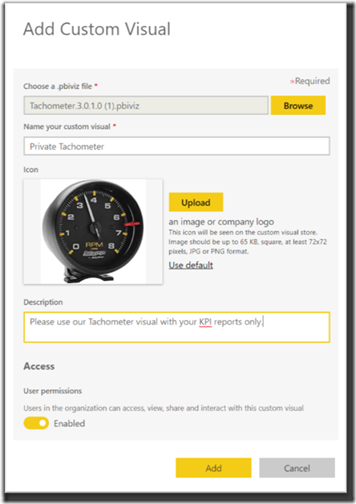 The Power BI administrator manages and deploys the organizational custom visuals through the admin portal. 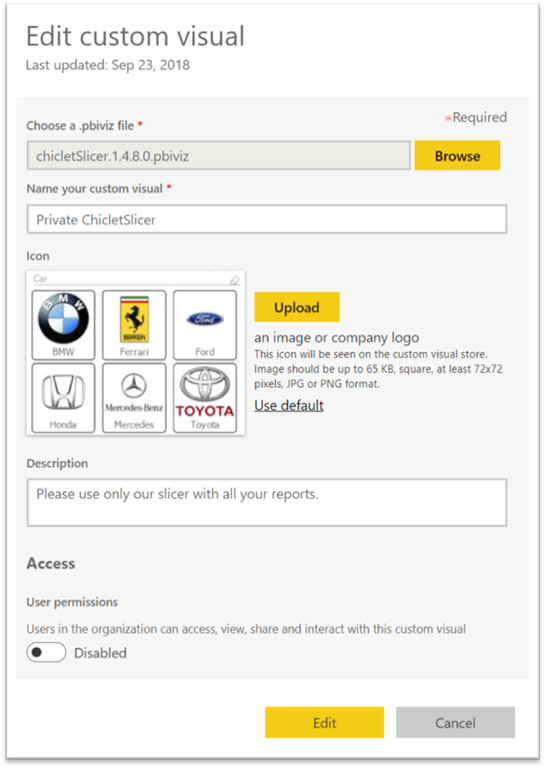 To upload an organization visual to the organizational store the Power BI admin should click on “Add a custom visual”, fill out the needed information and upload the required files. 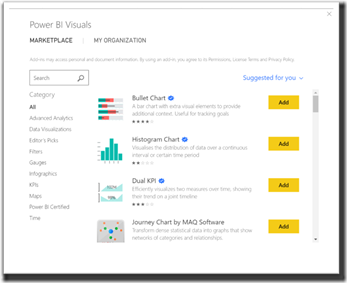 Once deployed into the organizational repository, users in the organization can easily discover them, and import the organizational custom visuals into their reports directly from Power BI Desktop or Service. How can the admin manage those visuals? In the Admin portal, under the "Organizational custom visuals" tab the admin can see and manage all the organizational custom visuals in the enterprise: add, disable, enable and delete. There is no need to share those visuals by emails or shared folder anymore! Once the admin uploaded a new organizational custom visual’s version everyone in the organization gets the same updated version. Report authors do not need to delete the visual in their reports to get the new version of these visuals as all reports using these visuals will be automatically updated! The update mechanism is similar to the marketplace visuals. Where can report authors find the organizational custom visuals? 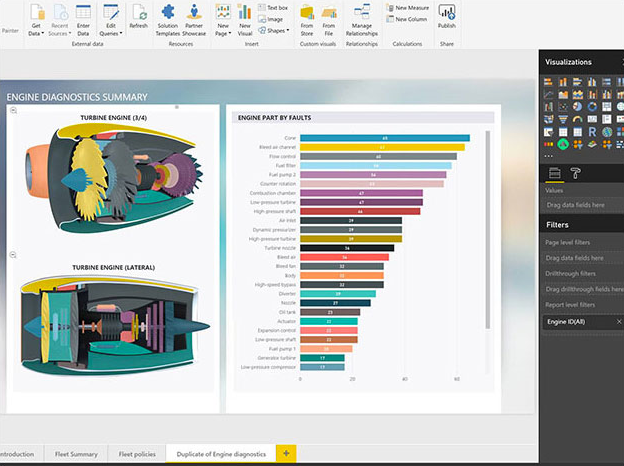 Organizational custom visuals are easily accessed from the built-in store, under "MY ORGANIZATION", from both Power BI Desktop and Service. 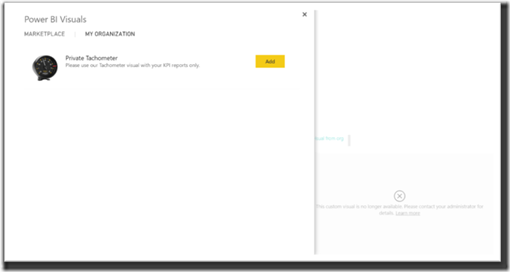 Report authors will have to log-in even if they are using the Power BI Desktop. Otherwise they will not be able to access the organizational store. Users in the organization can use those visuals in their reports as any other visuals. If for any reason the Admin decided to disable a visual from the organizational store, they can do so through the Admin portal. By selecting the setting gear of that specific visual and disable it under "Access". 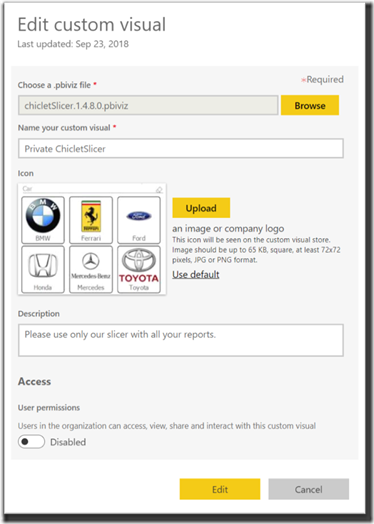 In our example users in the organization will not be able to use the private ChicletSlicer visual from the private store. All private ChicletSilcer visuals in existing reports will display the above error message. At the same time report authors see only the private Tachometer visual in the organizational store both in desktop and service as the private ChicletSlicer visual was disabled by the Power BI admin. Note here that the Admin only had to disable the selected visual from the Admin Portal and it was automatically disabled to everyone in the organization! In the same way, Admin can delete entirely an organizational visual. End users using the deleted visual in existing reports will also get an error. If the administrator uploads a custom visual from the public marketplace to the organizational store will it be automatically updated once the vendor updates the visual in the public marketplace? No, there is no automatic update from the public marketplace. It is the Admin's responsibility to update the organizational custom visuals' version if desired. Is there a way to disable the organizational store? No, users will always see the "MY ORGANIZATION" tab from the Power BI desktop and service. Admin can disable or delete all organizational custom visuals from the admin portal and the organizational store will simply be empty. If the administrator disables custom visuals from the Admin portal (Tenant settings) will users still have access to the organizational custom visuals? 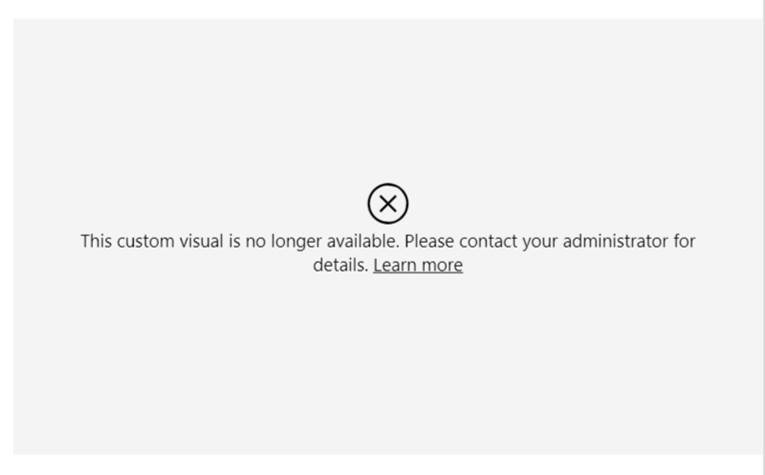 Yes, if the admin disables the custom visuals from the admin portal that will not affect the organizational store. 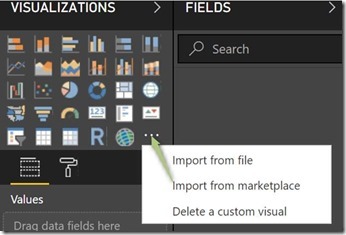 In fact, that is one of the organizational store use-cases, some organization disable custom visuals and enables only hand-picked visuals that were imported and uploaded by the Power BI administrator to the organizational store. 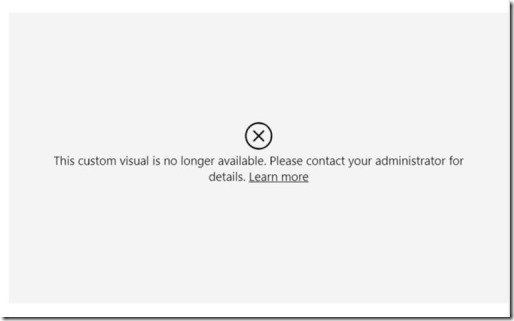 Note that disabling the custom visuals from the Admin portal is not enforced in Power BI Desktop. Desktop users will still be able to add and use custom visuals from the public marketplace to their reports. 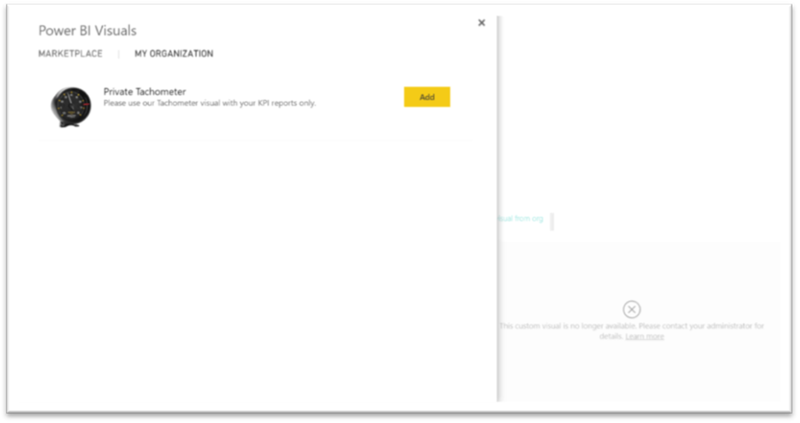 However, those public custom visuals will stop rendering once published to Power BI Service and will issue appropriate error. 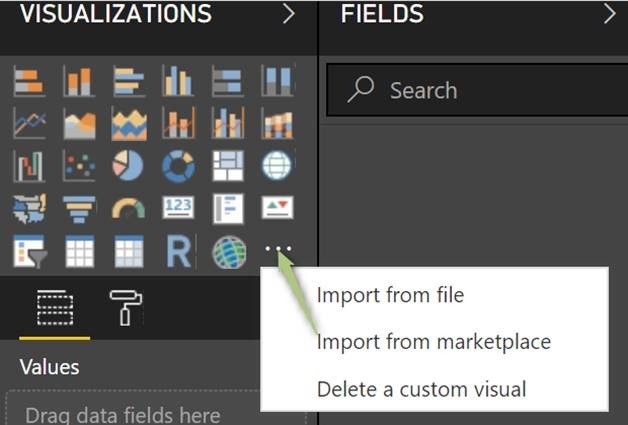 Users using Power BI Service, though, will not be able to import custom visuals from the public marketplace but only visuals from the organizational store. That is because the custom visuals setting in the admin portal is enforced in the Service. To sum up, why organizational store and organizational custom visuals is a great enterprise solution? Everyone gets the same visual version which is controlled by the Power BI administrator. Once the admin updates the visual's version in the admin portal, all the users in the organization get the updated version automatically. No need to share visual files by email or shared folders anymore! One place, visible to all members who are logged-in. Security and supportability, new versions of organizational custom visuals are updated automatically in all reports similar to marketplace visuals. Users in the organization using the organizational custom visuals needs to be logged-in to see and use the organizational custom visuals which is a security element for organization. Admins can control which custom visuals to be available in the organization. Better security enforcement as those visuals will be allowed for organizational members only. What is the organizational custom visuals limitation? Legacy custom visuals (such as custom visuals that are not built on top of the new versioned APIs) are not supported. 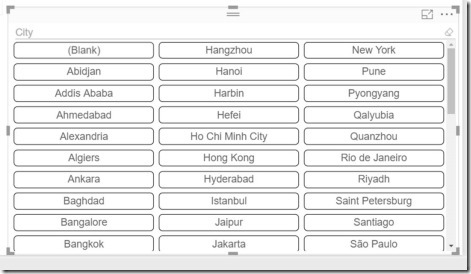 Visio visual, PowerApps visual, Mapbox, and the GlobeMap visual from AppSource marketplace will not render if deployed through the organization repository. Organizational custom visuals are private visuals imported from the organization repository. As any private visual they can not be exported to PowerPoint or displayed in emails received when a user subscribes to report pages. Only certified custom visuals imported directly from the marketplace support these features. Is there any more documentation to read?